This 100% barley juice concentrate is the basic Alka-Line product. Recommended as the best overall body alkalizer, it is grown under organic conditions, contains no chemical fertilizer, insecticides or pesticides. It's not diluted, so it provides the maximum concentration of the naturally chelated colloidal alkaline mineral so vital to health. Don't be fooled by other barley products which may be diluted by up to 40% by Maltodextrin and brown rice, which means they may be up to 40% less effective than Alka-Green in alkalizing the body. Available in 300 tablets and 5oz. powder. 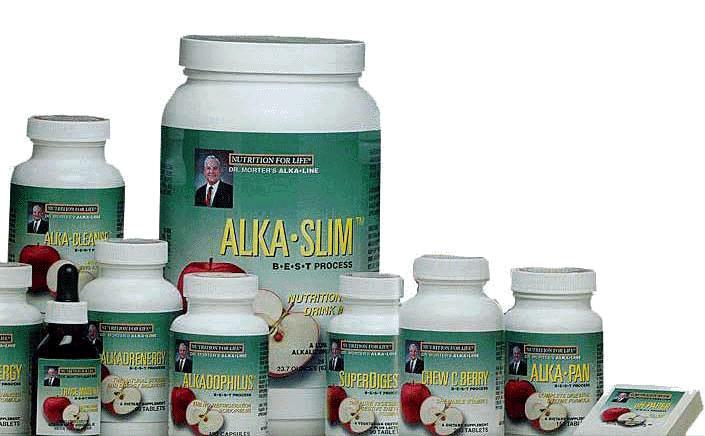 A revolution in weight reduction and dietary supplementation, Alka-Slim is the only weight reducing health-enhancing product specifically designed to alkalize and energize at the same time! A low-protein plant powder easily mixed with fresh or bottled fruit juices. This advance formula provides the natural nutrients for adrenal gland function and is ideal for helping to �jump start� or �boost� the system. It employs a natural synergistic affinity between vitamins B, the end result of this, and C, Zinc Manganese, Schizandra, Chinese Licorice and Adrenal Extract. Provides several kinds of beneficial bacteria for the colon. Particularly beneficial for those who have been on antibiotics or those drinking chlorinated water. This product contains 1.5 billion organisms per capsule. Unlike most other acidophilus products, Alkadophilus has a shelf life of one year without refrigeration Guaranteed! Contains Lactobacilli, Bulgaricus, Caucasicus and Yoghurti in a Beet Fiber and Rice Powder base. The colon should naturally contain bulk for the stimulation of peristalsis. Alka-Cleanse contains Psyllium and herbs for stimulation to clean out old toxic residues. This product is also an excellent, mild, non-chemical, natural laxative. This specially designed product is not an artificial stimulant. Its uniquely balanced formula represents the state-of-the-art in nutritional understanding. Alkadrenergy alkalizes the body and provides raw materials necessary for adrenal support, stress reduction and enhanced energy. This product is perfect for those on a vegetarian diet. This supplement is designed to reduce stress in the body and aid digestion. The body�s pancreatic enzymes are designed as a �clean-up� system and Alka-Pan is used to supplement the functioning of an exhausted system. A digestive enzyme derived from plants, this product works to replace enzymes destroyed by cooking. SuperDigest contains 7 plant digestive enzymes, including Lactase, which helps in the digestion of milk and diary products, Amylase, Protease, Lipase, Cellulase, papain and Bromelain. These enzymes aid in the stomach�s digestive process and may help to acidify an acid-deficient stomach. This formula represents the ultimate in enzyme science! Designed to provide 125 mg. of Vitamin C. Contains Rose Hips and Citrus Bioflavoroids complex which supplies over 200% of the U.S. RDA for adults.